The farming village of Blaugies, Belgium in the French-speaking Wallonia region of Southern Belgium is about one mile from the French border. 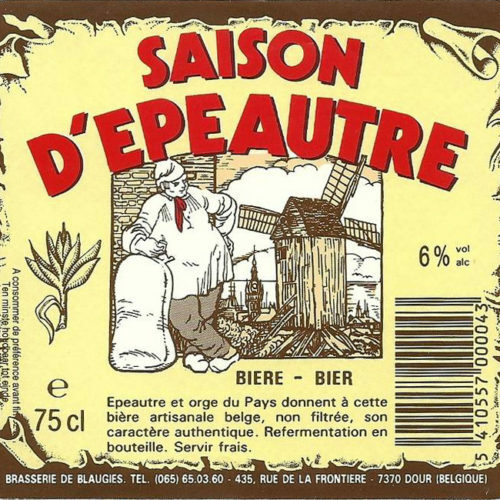 Wallonia is famous for its farmhouse beers, known as Saison. The Carlier family has operated this small brewery since 1988, now in its second generation of operation. The family also runs an onsite restaurant on the brewery grounds, Le Fourquet. This 5.8% ABV Belgian ale with figs has an interesting history. A traditional style named for John Darby, preacher of temperance whose parishioners were oddly moved by a ‘soft drink’ they insisted was just fig juice. The Blaugies Darbyste is a saison made with wheat and fermented with fig juice. A variant of the Belgian “Wit” or “Blanche” style, but a little drier and a lot more substantial and flavorful. Darbyste is hand-brewed in small batches per their Grandmother’s recipe by the impassioned, gifted Blaugies brewers, a husband, wife, and son team. The family enjoys good food and beer, and consumes a lot of its own product for cooking and drinking.